Tampa native, Sam Piazza was born with Down syndrome. The love and support of his family, church, and an inclusive school culture helped him accomplish extraordinary things. Sam’s positive attitude, courage and desire to achieve more than was expected is an inspiration to all of us. Sam not only overcame tremendous obstacles, but he now uses his life to help others. 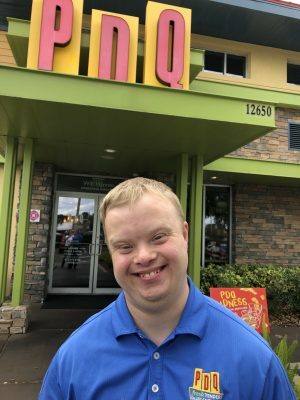 He works tirelessly as a volunteer Ambassador for Best Buddies International, volunteers at Gigi’s Playhouse, has earned a black belt in karate, participated in the ROTC, was the volunteer basketball team manager in high school and active in the Special Olympics. In 2009, he caught the eye of filmmaker and fellow Tampa native, Renee Warmack, who read an article in The Tampa Tribune about how he was crowned Homecoming King at Gaither High School in Tampa. The documentary “Because of Sam” will show the world that being different can be difficult, yet the conflicts, triumphs and epiphanies that occur in the life of a person with disabilities can serve as catalysts for positive change in the lives of other people. This movie will change the viewers’ belief systems from that of doubting the capability of people with disabilities, to believing that they can achieve great things. Furthermore, the viewers will reflect on their own lives and be inspired to tap into their potential to pursue their goals. Tampa native, Renee Warmack, MPA, is a Producer, Speaker, and Coach who grew up in a blue-collar family and is the youngest of three girls. At an early age, she knew that earning an athletic scholarship was the only way she could afford college. She worked hard to excel as a multi-sport, high school athlete and ultimately earned a tennis scholarship at the University of South Florida (USF). Warmack earned her BA degree in Creative Writing and a Master’s degree in Public Administration at USF. In 2008, she produced, directed and wrote “A Community with a Dream: The Founding of the Children’s Board” (CBHC) a documentary that commemorates the 20th anniversary of a special taxing district in Tampa dedicated to helping kids succeed. The film describes the touching, grassroots effort that led to the creation of the CBHC. The movie premiered on government television and was widely embraced by the community. Warmack produced her first film in 2007, with NO filmmaking training. The documentary, called “Ten at the Top in Tampa Bay”, chronicles the careers of top female government leaders and shares how they broke the glass ceiling. She produced, directed and wrote the documentary to celebrate an unprecedented time in Tampa history where 10 women led (at the same time) government institutions. The movie premiered on PBS in 2007, aired on government channels, was featured in film festivals, to include the Gasparilla International Film Festival. Warmack retired in 2017 from a 20-year government career where she worked in human rights advocacy, public relations and program administration. Her inspirational movies, engaging events, and impactful coaching program are game-changers that help empower dreamers. Sam Piazza was born and raised in Tampa (Hillsborough County), Florida. Setting the film in Sam’s hometown adds charm and authenticity to the story. The city’s diverse population, inviting communities and winding Hillsborough River make it a meaningful and attractive backdrop for Sam’s journey. 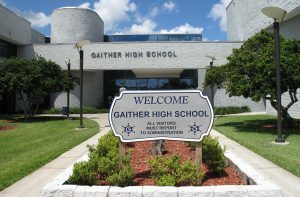 Showcasing the schools Sam attended, Tampa’s cultural landmarks, and the beautiful waterways found in the Sunshine State will reveal the character of this major port city. Production of the documentary film Because of Sam will put Sam Piazza’s story on a global stage. 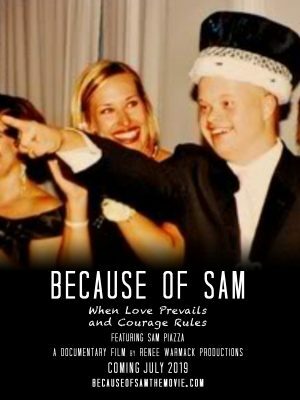 A longer-term vision of Sam’s and filmmaker Renee Warmack is to use the documentary Because of Sam as a catalyst to create awareness about Sam’s story so that it can launch the process for producing a major theatrical film, in Tampa, that is based on Sam’s life, similar to Where Hope Grows or Rudy. Tampa has yet to produce a major feature film about a hometown hero like Sam Piazza and Tampa native, Producer, Director and Writer Renee Warmack intends to do just that. Check out cool pictures of Sam, his family, and friends. If you'd like to be notified about updates for the film, "Because of Sam," enter your details below. This includes behind the scenes video, Facebook live updates, investment opportunities, release dates, and more.